Mission #99, to 14 Jan 1944 to Gueschart, France "Crossbow" guided missle target, in 359th BS B-17F 42-3029 Wallaroo (BN-N), MACR 1965. Capt Merle L. Hungerford (Pilot)(POW). Wallaroo sustained a direct flak hit in the vicinity of Foret-de-Crecy, France. The control cables were severed and the B-17 went out of control, spiralled towards the ground, and exploded. The entire crew made successful parachute jumps and watched their B-17 crash at Foret de Crecy, 10 miles ENE of St Vallery-sur-Somme, 10 miles North of Abbeville. Wallaroo crashed near the anti-aircraft gun that shot it down. Original CoPilot 2Lt Clayton C. David and Ball Turret Gunner Sgt Theodore R. Czeczotka did not fly with their Lt Arundale crew on this mission. Sgt Robert L. Clink (BTG)(POW) , a member of the Lt Marshall L. Smith crew, on his 6th mission, was the substitute Ball Turret Gunner. Sgt Arthur C. Nilson, Jr. (Photo)(POW) flew as a Photographer with the Lt Arundale Crew on his 5th mission. Lt Arundale flew as CoPilot. The crew was captured immediately by nearby soldiers. The officers were imprisoned at Stalag Luft I. 2Lt Karl B. Arundale (P) - Flew as his Crew Pilot on one mission (#93). His other five missions were flown as CoPilot with Capt Merle H. Hungerford as Pilot who was on his 13th mission. 2Lt Clayton C. David (CP) - Flew on four combat missions (#93 with his Lt Arundale Crew and missions #90, 95, 98 with Lt Jack W. Watson as Pilot.) On mission #98, 11 Jan 1944, to Oschersleben, Germany in 358th BS B-17F #42-29524 Meat Hound (VK-K), the B-17 was severely damaged by German fighters shortly after dropping their bombs and leaving the target area. The number three engine was shot out and both inboard engines were feathered to reduce drag. When reaching the Zuider Zee, east of Amsterdam, Meat Hound was again hit by German fighters. A fire was started in the #2 gas tank. Lt Watson issued the bail-out-order and rang the bell to abandon the burning B-17. 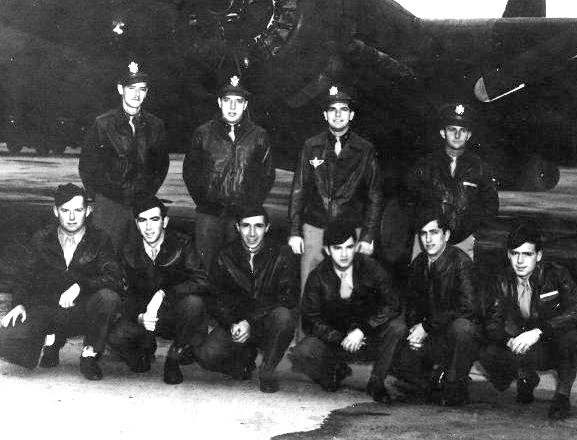 All of the crew bailed out with the exception of Lt. Watson who decided to attempt to fly his badly damaged and burning B-17 back to England. He retuned his damaged B-17 alone to a fighter field at Metfield, England. Four of the crewmen drowned, four were captured and became POWs and Lt Clayton C. David, with the help of the Dutch underground managed to evade capture and returned to England on 25 May 1944 via Holland, France, Spain and Gibraltar. The 303rd BG(H) lost 11 missions on this mission and were later awarded, with the rest of the 1st Air Division, the Presidential Unit Citation. A 1988 book "They Helped Me Escape: From Amsterdam to Gibraltar in 1944," authored by Clayton C. David (ISBN O-89745-101- 5) tell's the story of Lt David's remarkable escape. Clayton David later became one of the leaders in the Escape and Evasion Society. Crewmen who flew all of their six missions with Lt Arundale as Pilot or CoPilot and became POWs. S/Sgt Theodore R. Czeczotka (BTG) - Flew three missions with the Lt Arundale Crew (88, 93, 95). Substitute Ball Turret Gunners were used on missions 96, 98, 99. S/Sgt Czeczotka flew on 29 additional missions with nine other Pilots as Ball Turret Gunner or Togglier. Ten missions were with Lead Crews. Completed his combat tour on 19 June 1944 (Mission #185). See Lead crew photos for missions 145, 147, 152, 155-B, 160, 178. 2Lt Joe B. Vogel (N)(POW) - Flew mission #95 with another Pilot plus six missions with his Lt Arundale Crew.